An author’s reprint edition Green Woodworking is now in print. Rodale Press originally published this title in 1987. In 1995 Lark Books published a revised edition. Corrections were made, and the text was brought up to date. The new author’s reprint is the same as the Lark version, except for the covers. Contents include chapters on materials, knife-work, hewing, riving, shaving, boring, bending, and joinery. Each chapter concludes with a project that showcases the chapter subject and techniques. There is an appendix on making a Swiss-German style shaving horse, and another on hickory bark seating. The Chairmaker's Workshop is now available in an Author's Reprint Edition. The color gallery photos in the original version are now black and white. Many small errors have been corrected among other changes to make this author's reprint edition an improvement over the original. 304 pages with soft cover in color. Drew Langsner’s classic text, The Chairmaker’s Workshop was originally published in 1997 by Lark Books. Written to serve as both an introduction and working reference for anyone interested in making both post-and-rung and Windsor chairs. "This is the best book on chairmaking. Period. Everyone knows that, which is why the price for the used books is so high. Go to Drew Langsner's website for Country Workshops and you can get the updated author's reprint for a very reasonable price. While you're at it, sign up for one of his classes. I learned more about furnituremaking and craft in one week at Country Workshops than I have learned over the past ten years reading every woodworking book in the library." Part II. Step-by-step tutorials for making 3 chair types: a 2-slat ladderback, a rustic stick Windsor, and a bow-back Windsor side chair. Part III. Scaled plans and notes for making 8 other post-and-rung chairs and Windsors, including a post-and-rung rocking chair, 4 classic American Windsors, and a double hoop English Windsor. Part IV. Making a shaving horse, a chairmaker’s workbench, a spring pole lathe, and several options for constructing a small drying kiln. Plus a chapter on designing a chair, with 4 pages of tables for calculating sighting and resultant angles for boring legs and spindles on Windsor chairs. The book also includes a chairmaker’s glossary and an annotated bibliography. Over 300 drawings, and more than 200 photographs. With an Introduction by Welsh chairmaker, John Brown. Softbound, 304 pages. All books purchased from Country Workshops come with an author's autograph. Carving spoons and bowls continues to be an area where more and more woodworkers find their special niche. The English version of Wille Sundqvist's book "Swedish Carving Techniques" was published by Fine Woodworking in 1990. Perhaps 10 years later it was discontinued. Used copies became expensive, if you could find one. We are pleased to announce that this classic book is available once again. Nothing has been changed, except for the inevitable price increase. Now available from the CW Store. You can purchase a copy by phone (828 656 2280) or e-mail. DL-06, DL-07 and DL-12 are large bond print plans for chairs that Drew has designed and that have been the course projects for Country Workshops’ chairmaking classes. These consist of a full-size plan view with seat details, arm/comb patterns, leg/spindle boring angles, and a profile view from the seat up. (Leg and stretcher design details are left to the individual maker.) DL-06 is the rustic Windsor that Drew currently teaches during tutorials and summer workshops. (This is not the Stick Windsor in The Chairmaker’s Workshop.) This rustic Windsor can be a high-back or low-back version. The Hearth Chair plan (DL-07) includes two large bond print sheets plus an 18 page photocopy of an article on constructing a slightly different version of this chair, which originally appeared in “Woodwork” magazine, issues 58 and 59. DL-12 is a new design for a rustic Windsor settee. These plans are rolled and sent by regular mail in a shipping tube. Prices include postage for U.S. customers. Note: DL-06 and DL-07 plans are design copyrighted © by Drew Langsner. Purchase constitutes a license to make one reproduction for personal use or as a gift. For all other purposes, purchaser agrees to contact Drew Langsner (at Country Workshops) for details regarding royalty arrangements. OUR SHAVING HORSE, which we call a “shaving mule” can be purchased ready-made from us, or you can make your own. The Shaving Mule Plans Pack consists of ten 8-1/2 x 11” pages of detailed drawing and instructions. THE SPOON, THE BOWL AND THE KNIFE  A Documen­tary about the Swedish craftsman Wille Sundqvist. Wille’s son Jögge has produced this new video with help from a Kick Starter fund drive, CW and the Swedish Cultural Ministry. There are segments on growing up in the old Swedish rural culture, and a little on Wille’s love for turning bowls. But the program is mainly instructional. Here’s a chance to see how Wille carves a spoon, based on skills with a carving axe, knife and a gouge. Wille shows his spoon carving knife grasps, sharpening, and engraved surface decoration. This is also a chance to get a glimpse of what northern rural Sweden looks like  it’s quite special. Recorded in 2013 when Wille was 87 and still carving almost every day. With English subtitles. Peter Follansbee’s recently released DVD is titled “17th Century New England Carving.” Watching the program is not quite the same as being at Country Workshops for Peter’s class, but this is a really good instructional video. The material is well organized and presented, with sections on Tools and Materials, Postures and Grips, and a series of practice exercises in technique and design. Produced by Lie-Nielsen Toolworks. Watch these CW videos for Free! 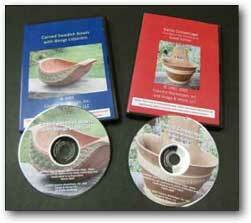 COUNTRY WORKSHOPS' CLASSIC DOCUMENTARY VIDEOS - "Carved Swedish Bowls with Bengt Lidström" and "Swiss Cooperage - Two Days in the Workshop of Ruedi Kohler" are now available to view on our YouTube Channel. The dvd versions are no longer being distributed. MAKE A CHAIR FROM A TREE. J. Alexander has produced this 2 hour video which shows how he makes a post-and-rung chair. Every step is carefully shown and explained, from splitting an oak log to weaving a Shaker tape seat. Carving Swedish Woodenware. This instructional video clearly shows how Jögge carves a serving spoon and a large bowl. Stock for the spoon was a rhododendron limb with a nice natural curvature. The bowl came from a split tulip poplar log blank. It was carved with the traditional pith up/bark down orientation. The video was originally released as a VHS cassette tape. When sales declined Taunton dropped this production, so it has been unavailable for several years. Taunton has recently decided to re-issue some of their old material, and “Carving Swedish Woodenware” is now available in DVD format.